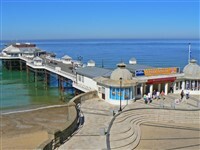 Cromer is a coastal town and on the north coast of the English county of Norfolk. and cafes. The fishing industry may have declined, but Cromer crabs are still as famous as ever with fishing boats, launched from the beach in season, tending to hundreds of crab pots. Cromer also contains several museums including the Lifeboat Museum and the Cromer Museum.